The Thames Fishmarket on Wharf is a popular spot with Fish and Chips Takeaways and a Cafe. Great views of sunsets over the Firth of Thames looking to the Hunua Ranges. Thames is the gateway to the Coromandel Peninsular. 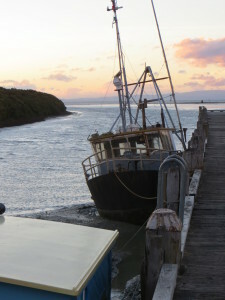 The fishing trawler, pictured aground at low tide, is probably a long liner, targeting snapper fish.